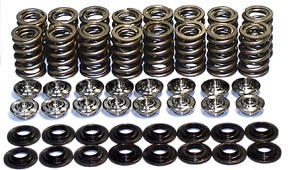 APE complete valve spring and titanium retainer kit for the Kawasaki ZX14. Feature increased pressures from seat to max lift and approx .100" more travel than the OEM springs. More than enough pressure to control the most aggressive cam lobe designs with the peace of mind that only the dual spring design can offer. The CNC machined retainers features slightly deeper shim bores for maximum shim control. Includes steel spring bases. 58 LBS Seat Pressure. Coil Bind @.510" , STOCK has 32 LBS on seat and coil bind @ .435"